C. Bríd Nicholson is associate professor of history at Kean University, in Union, NJ. Nicholson, C. Bríd. Documents of the Lewis and Clark Expedition. ABC-CLIO, 2018. ABC-CLIO, publisher.abc-clio.com/9781440854569. 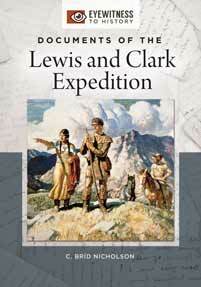 Through its extensive use of primary source materials and invaluable contextual notes, this book offers a documented history of one of the most famous adventures in early American history: the Lewis and Clark expedition.